Whitby 42 owners in TX? TOPIC: Whitby 42 owners in TX? Recently bought a '75 42 with a rather strange bimini structure. Would like to look at a Whitby with a regular bimini to see how the main sheet is handled. We live in the Houston area so anything along the Gulf Coast would be good. Due to the rather large bimini, that's how the main sheet is currently run. 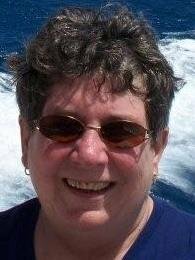 May consider leaving it that way if we redo te bimini. 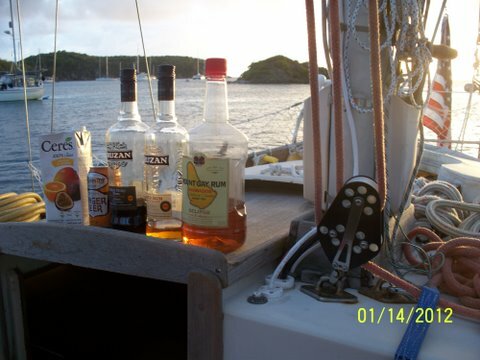 Ignore the rum bottles -- that's another story -- but here's a pix of our sheet placement before we moved it to the mizzen. Cheers. That's about how it was setup on our last boat. Right now it appears to be attached to the bimini and then the mizzen mast. I'll take a closer look next time I'm on the boat. If we redo the bimini we might just leave it attached to the mizzen mast.